Antique - Booth's China, Real Old Willow-Blue Pattern #A8025, 13 3/8" Ironstone Platter, with 22kt Gold Verge, Rim and Trim. Circa 1910 thru 1930. Three other sizes available, view Items P113, P115 and P116. 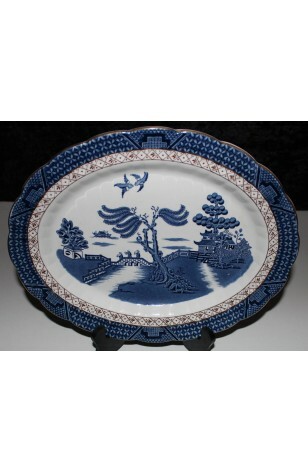 This is a beautiful 13 3/8" Ironstone Platter, made by Booth's China in the 1910-1930 time frame. Fantastic Coloring and Detail, with heavy 22kt Gold on Verge, Rim and Trim. Booth's impressed Mark on the bottom is clearly read./ Design is of the Willow Tree, 3-Children crossing the Bridge, 2-Birds Flying overhead, a Pagoda on the Left Side... Some age crazing, but excellent overall condition for the age. Antique - Booth's China, Real Old Willow-Blue Pattern #A8025, 13 3/8" Ironstone Platter, with a 22kt Gold Verge, Rim and Trim. Circa 1910 thru 1930. Three other sizes available, view Items P113, P115 and P116.